In June, two Neohumanist educators from distant corners of the world were among the 230 participants from 51 different countries that gathered together at the Futures of Education Conference in Florence Italy. The conference’s aim was to promote the sharing of good practice and transnational cooperation in the field of the application of innovative education and training strategies, methodologies and solutions. Didi Ananda Devapriya from Romania, Andressa Ayres Pelanda, from Brazil, presented their papers on Neohumanist Education in the “Innovative Teaching and Learning Methodologies” category. Though they had not consulted with each other previously – the papers were very complementary, each reinforcing the others message from a different angle, and were equally well receive by the audience. Much of the emphasis in the conference was on different types of emergent IT technology available for modern classrooms. The Neohumanist representatives brought in a different perspective, highlighting the need for educating children for holistic balance, especially in light of the increasing speed and accompanying stress of the modern world. 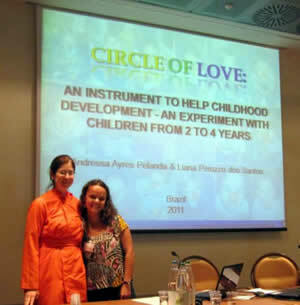 Andressa’s paper studied the results of applying the Circle of Love curriculum within a public school in Brazil, while Didi’s paper made an argument for deliberately including curriculum to train introversial skills, not only the more typical focus on extroversial skills in exploring and mastering the world through language, maths, sciences, physical ed, etc. The conference provided an opportunity to present Neohumanist Education to the academic community and many new contacts were made, offering possibilities for future collaborations and joint projects. Andressa Ayres Pelanda paper, which she co-authored with Liana P. dos Santos, was published in the last issue of Gurukula Network and in this issue we are happy to share Didi Ananda Devapriya’s paper.